Immunohistochemistry analysis in formalin fixed and paraffin embedded human testis tissue using ASXL1 Antibody Cat.-No AP50279PU-N followed by peroxidase conjugation of the secondary antibody and DAB staining. Confocal immunofluorescent analysis of ASXL1 Antibody (Center) Cat.-No AP50279PU-N with Hela cell followed by Alexa Fluor 488-conjugated Goat anti-Rabbit lgG (green). Actin filaments have been labeled with Alexa Fluor555 phalloidin (red). DAPI was used to stain the cell nuclear (blue). Western blot analysis in mouse liver tissue lysates (35ug/lane) using ASXL1 antibody (Center) Cat.-No AP50279PU-N.This demonstrates the ASXL1 antibody detected the ASXL1 protein (arrow). 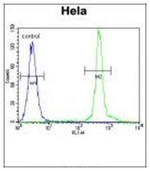 Flow Cytometric analysis of Hela cells (Right Histogram) using ASXL1 antibody (Center) Cat.-No AP50279PU-N compared to a negative control cell (Left Histogram). FITC-conjugated goat-anti-rabbit secondary antibodies were used for the analysis.